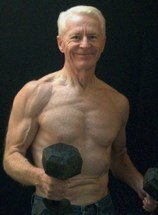 The Gray Iron Fitness Newsletter, Issue #49- How Hard Should Seniors Train? In today's September 1, 2010 newsletter . . .
How Hard Should Seniors Train? That’s a question like "How long is a piece of string?" . . . We all have different capacities and goals. Genetics play a role, of course. But most of the time that only means the odds favor certain family tendencies. How we manage our lives more than anything else determines outcome, for better or worse. 1. Resistance movements to build and/or retain muscle. 2. Cardiovascular work for heart and lung health. 3. Flexibility exercise to maintain . . . well, flexibility. And there are various ways to achieve this balance. One size does not necessarily fit all. Most people who read this newsletter choose free weights of some kind (or resistance bands or various weight machine devices) for their resistance training. Some may also include bodyweight calisthenics. Whatever form you prefer, you may wonder just how hard you should push yourself as you grow older. The answer is that each of us must decide on his or her own training goals while taking into account stage of life. Say you are a young senior in your fifties. Then you are more than likely lifting heavier than a similar trainee in his sixties or seventies. Does that make sense? My own attitude is to keep training for as long as nature allows me to. I hope until the end of life. So far, so good. But at 73 I am certainly not capable of what I was doing in my fifties. For example, during that decade I still enjoyed martial arts. But at about age 59 I stopped any workouts that involved actual grappling, kicking and punching. My body told me I should tone things down. In my sixties, I did lead cardio-kickboxing classes, a heck of a workout, but still a walk in the park compared to sessions where people were hitting back. Though I was never really a super-strong guy, in my fifties and through most of my sixties I was still lifting reasonably decent poundage for my age. I have never believed in training to absolute failure, but I pushed pretty hard. At some point in my mid- to late-sixties, my body spoke to me again and I began gradually backing off a bit by doing higher reps with less weight. All-out maximum lifts send your blood pressure sky-high, and that to me doesn’t seem like the smartest thing to do as we get up there in years. Your doctor will say thank you. Today, my reps may range anywhere from five to 15 per set. Naturally, when I'm doing low five rep sets I’m doing them so I can handle heavier weights. But I don’t let my ego or anything else goad me into being foolish. You don't want to blow a gasket. Regardless of what kind of fitness training you happen to prefer, blown out knees, bad backs, chronic joint aches, or even worse developments aren’t fun and aren’t what smart fitness is about. I always liked what Bill Pearl (a very strong man) said: "Finish your workouts still leaving a little gas in the tank." My own advice: Don’t ever stop training, but as you grow older Bill Pearl’s wisdom should become more important than ever. In other words, be neither a workout wuss nor a self-destructed and beat-up former trainee. Be smart. Set goals and press on, but make them age appropriate. This little beauty (for experienced exercisers) includes only two compound movements, one pushing exercise and one pulling movement, performed back-to-back in superset fashion. But get ready to fall in love. It hits every muscle you've got, from your hips to your head. Bonus: Even your legs get a nice little stretch (but you will need some sort of squat, lunge, or dead lift movement before The Stupendous Upper-Body Workout can be called The Stupendous Full-Body Workout). Here is how it works. Back-to-back, alternate Dive Bomber Push-Ups with Horizontal Pull-Ups. Do supersets of between five and 10 reps of each exercise. Keep doing sets until you've had enough. Simple. Or do ladders, beginning at one rep for each exercise and keeping adding another one rep to each new set until you reach a set when your reps are about two away from failure. Then stop. Take a breather. If you're up to it, start at one rep and ladder again. Either method you choose, this exercise combo is fun and a great, great workout. In fact it's - stupendous. Just writing about it makes me want to put on my gym clothes.